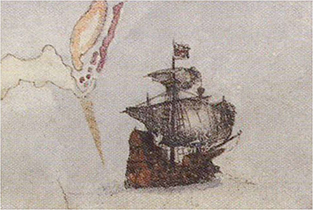 In 1585 Sir Richard Grenville’s capture of the Spanish vessel Santa Maria de Vincenz´ provided him with both ample funds and a workforce, in the form of captured Spanish prisoners. He put both to work constructing a grand mansion for himself, known as New Place. Forcing the prisoners to labour and even requiring the ship’s captain to carry stone for the construction, his treatment of these captives caused outrage in Spain. The eventual fate of New Place House is unknown, but three things are certain: it was considerably larger than the previous manor house, for it paid twice as much in church rates; it was still standing in 1672, for they were paid in that year; it was on a quayside, for the church record indicates as such. Some suggest that New Place House was on the quay-front west of the river, i.e. the ‘Established Key,’ but it seems more logical that it should have been near “The Key” on the East as that belonged to the Grenville’s (i.e. Brunswick Wharf area, see Annex 1). Such a location would also have been conveniently close to the grange lands and their other properties in East-the-Water. In 1587, ongoing hostility between the English and the Spanish descended into war. The Spanish Armada of 1588 brought the local area to arms and, out of gratitude for its support, Bideford was declared a free port in perpetuity. The Armada is sometimes claimed as the source of the canons that now embellish Chudleigh Fort, but they are of a much later design. For those wishing to see Armada era canons, those over the Torridge in Victoria Park are more likely to be authentic.